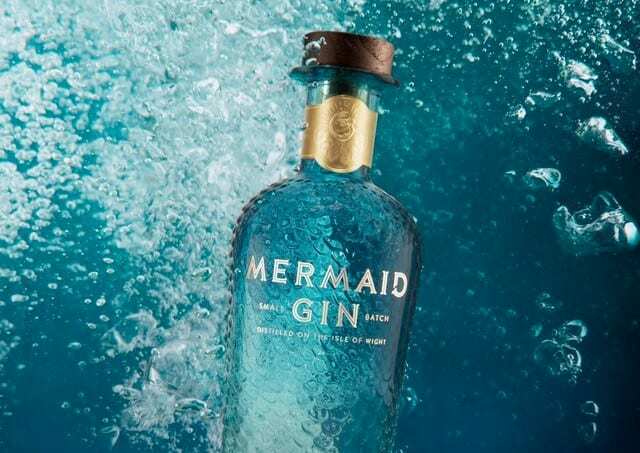 Mermaid Gin, from the Isle of Wight’s only distillery, has had a major makeover – with a striking new sculpted bottle, going plastic-free and switching to entirely recyclable materials – following a year-long research project backed by a private external investor. The flagship spirit of the four year old Isle of Wight Distillery and already stocked by Marks & Spencer, the gin’s re-imagining sees it presented in a highly tactile bottle with sculpted scales that reflect and refract light. The scales swirl downwards around the bottle to resemble the tail of the eponymous mythical sea creature, while the colours mimic the gin-clear blues of the Mediterranean, down to the deep greens of Mid-Atlantic rollers. Tactility is enhanced by being weighted forward for easy handling by consumers and bar-tenders alike, plus a flange for an easy pour. Created by long-time friends Xavier Baker (a brewer) and Conrad Gauntlett (a winemaker), the premium gin’s new look is described as ‘better complementing the liquid inside’ and is expected to markedly drive both distribution and sales. In addition, the bottle is now 100% recyclable – decorated with biodegradable paint and featuring an all-natural cork with a wooden top and a paper seal. The distillery has also demanded all its suppliers accept new sustainability challenges – such as stopping the use of bubble wrap and sourcing alternatives at every stage of the production and distribution process. Mermaid is a hand-crafted small batch gin distilled since 2014 using ten ethically-sourced botanicals. It’s a smooth yet complex blend that features the freshness of organic lemon zest, the peppery notes in grains of paradise and a hint of sea air from fragrant rock samphire (foraged from the Isle of Wight’s cliffs). Working with column stills for a smoother spirit, the process is tightly controlled and captures only the ‘hearts’ of each batch – the sweet spot of any distillation. The Isle of Wight distillery also produces a Navy Strength gin, a rum and a vodka. It has ambitious plans for 2019-20, with a range of extensions across all categories.